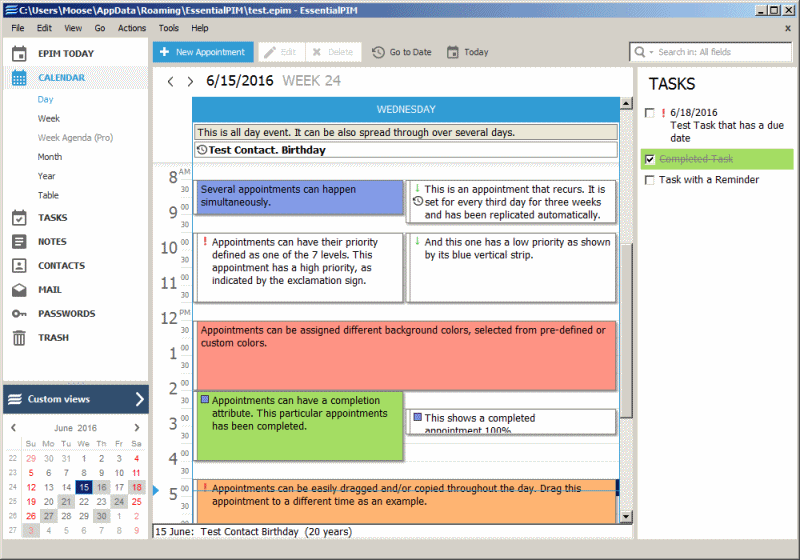 EssentialPIM includes a calendar/scheduler, todo list, contact manager, basic e-mail client, and tree-like multi-level notes tool that supports rich text, formatting and images. While many advanced functions such as synchronization and encryption are exclusive in the Pro version, the program is capable of manually importing from variety of formats including Outlook, TreePad, Google calendar etc. Additionally, it can export to many formats including HTML, vCard, iCal, RTF, CSV, iPod, text etc. How to extract: Download the "ElPIM Free Portable" ZIP package and extract to a folder of your choice. Launch EssentialPIM.exe. Always wanted to use this PIM because it has E-Mail integrated. Starts with an upgrade ad every other start, does anyone know how to disable? Must click skip to go to program. SeaMonkey is a complete internet suite with web browser, email & newsgroup client with an included web feed reader, easy HTML editor, IRC chat and web development tools. The browser supports fine-grained controls over images, cookies and more on a per-site basis. Based on Netscape Communicator and then Mozilla Suite, this software bundle includes many technologies used in Mozilla Firefox and Thunderbird and supports many of their add-ons. SeaMonkey, Portable Edition is a version of the software from PortableApps.com and works automatically with web-based Java apps if their jPortable tool is present. How to extract: Download the self-extracting EXE and extract to a folder of your choice. Launch SeaMonkeyPortable.exe. I use both this and the SeaFox extension (https://addons.mozilla.org/en-US/seamonkey/addon/sea-fox/) and after some further tweaking, I am pretty satisfied with the results. I use SeaFox as well, but I just use the Default theme. Classic Firefox theme for SeaMonkey doesn't really make much of a difference in my layout, except a few icon changes. Speaking of icons, use the Classic Toolbar Buttons addon to change some of the default icons. It doesn't change the Bookmark, RSS or Tab Throbber icons though. Version note: This program has not been updated since 2016 and may contain security vulnerabilities. Please see this entry for the latest version of Opera. Opera (Presto) is a discontinued version of the Opera web browser, meaning feature development and maintenance for this version of Opera has ceased. Compared to the newer version based on Google Chrome, it features a leaner memory footprint, more user-interface customization, an RSS reader, integrated e-mail client, IRC chat, and native BitTorrent support. A variety of extensions are available to further extend functionality. @billon mmm, it's odd. Just had a pop-up informing of a new version to download which is apparently v12.18 yet no official changelog has been released. Can't find what you are looking for? This list shows entries with Internet - Email Clients as a supplementary function. You can view more entries with Internet - Email Clients as a primary function.